For more info on the pathophysiology of pneumothorax. Up to 30% of pneumothoraces can be missed by CXR. CT is the gold standard but is impractical in a time critical situation. The sensitivity of US compared to CT approaches 100%. The negative predictive value of lung sliding is 100%. If lung sliding is present then a pneumothorax is excluded. Positive predictive value is much lower (about 30%) because a number of other conditions abolish lung sliding. Air collects non dependently ie anteriorly in a supine patient. This is the easiest area to image with US. Therefore a pneumothorax should be sought at the upper anterior point in a semi-recumbent patient and at the lower anterior point in a supine patient. Low frequency probes yield a more subtle image. High frequency (usually linear) probes give the best picture of lung sliding at and just below the plural line but will not provide a deep or sectoral image. Practice on your own machine to select the best probe and settings. I would encourage the use of a high frequency probe to start with to best appreciate lung sliding. The visceral and parietal pleura are usually closely opposed with a minute amount of fluid between them (not seen on US) and slide over one another with respiration. The appearance of this is a shimmering of the pleural line best appreciated with experience. In fact the whole of the sub pleural space between the ribs will shimmer. The pleural line will also have little blebs moving from side to side that looks a bit like ants crawling along it. Small artefacts projecting a few millimetres below the plural line (these are not B-lines) will move with sliding. Any B-lines present will move with lung sliding. An M-mode image with lung sliding present will show the ‘sea shore’ sign. Subcutaneous tissue above the pleural line generates horizontal straight lines while there will be a sandy appearance below the pleural line created by the movement of lung sliding. In pneumothorax the screen will consist only of the horizontal straight lines as all the sound is reflected back with reverberation artefacts (stratosphere sign). It is good practice to confirm sliding using 2D rather than M-mode to avoid potential pitfalls - M-mode is just used to record a still image for documentation. The stratosphere sign. Absent lung sliding on M-mode in a patient with a pneumothorax. Notice the absence of T lines (the lung pulse) - see below. The most important point to remember with lung sliding is that its signs arise at and below the pleural line and never above (vital to misinterpreting muscular sliding in dyspnoea and subcutaneous emphysema). If there is subcutaneous emphysema it can usually be moved out of the way with pressure from the probe. Subcutaneous emphysema obscuring the deeper pleura. The 2D and M-mode image will be more subtle. On M-mode only a minimal sandy appearance which stops at the pleural line is needed to rule out a pneumothorax. Note that bullae do not abolish sliding allowing the distinction between this and pneumothorax. Pneumonia and ARDS abolish sliding by adherences secondary to inflammation (exudative process) - otherwise known as pleural symphysis. Both will usually show B-lines allowing the ruling out of pneumothorax. These lines form a T with the pleural line on M-mode. They are caused by the transmission of cardiac activity through motionless or near motionless lung when sliding is reduced or absent. As transmission through lung is required they rule out a pneumothorax. This phenomenon can be seen on 2D by a tiny amount of pleural sliding in time with the heart beat (but it is much easier to appreciate on M-mode). The terms T-lines and lung pulse describe the same appearance on M-mode. T-lines (or lung pulse) in a patient with ARDS with absent lung sliding. Pneumothorax is ruled out. These features combined have a specificity of 96%. The lung point (100% specificity, 66% sensitivity). If a pneumothorax is suspected from the absence of sliding and presence of A-lines then the probe should be moved laterally until the lung point is found. This is where the pneumothorax ends and the pleura are again directly opposed to one another. It therefore maps the size and location of pleural air. Its appearance is that of signs of pneumothorax changing suddenly, and temporarily, to lung sliding or B-lines or both. It will appear and disappear with respiration as the join between pneumothorax and opposed pleura is moved by the moving lungs. Inspiration will bring it into view and it will disappear with expiration. It can be seen both with 2D and M-mode. The more lateral the lung point the bigger the pneumothorax. The lung point will obviously not be found if no part of the lung joins the parietal pleura (big pneumothoraces). A pause at any point in the respiratory cycle can be mistaken for the lung point on M-mode. Here you can see absent sliding on the right with an effusion (blood in this case) with underlying lung underneath it coming in from the left. If a pneumothorax is septated there may be some septa still attached to the parietal pleura giving rise to B lines at these points. This is more likely to be observed in cases of recurrent pneumathoraces. There will be no sliding and the lung point will still be visible. Occasionally pneumothoraces may not be anterior for example where there are lung contusions stopping the free movement of air against gravity. This is more commonly seen in children. They will be visible in the axillae. Even with large bullae the 2 pleural layers are still opposed so sliding will still be observed. Therefore bullae should not causes false positives for pneumothorax. A small anterior pneumothorax will usually not need draining even in mechanical ventilation. They can resolve spontaneously. It should be regularly assessed however as it can evolve - check the lung point is not moving laterally. Lung protective ventilation will lessen the chances of a pneumothorax increasing in size. A lateral lung point suggests a drain will be required. Repeat CXRs are not required. US is better for monitoring a pneumothorax. US should be routine after procedures which may cause a pneumothorax (central line insertion, thoracocentesis). Mapping the location of a pneumothorax means that traditional insertion sites for drains do not need to be used. Drains should be inserted away from the lung point. US should be used to demonstrate that the lung had expanded following drainage. It can then also be used to show that the lung remains expanded (the leak has sealed) following clamping a drain thus allowing confident removal before again repeating US to confirm no re-accumulation of air post removal. 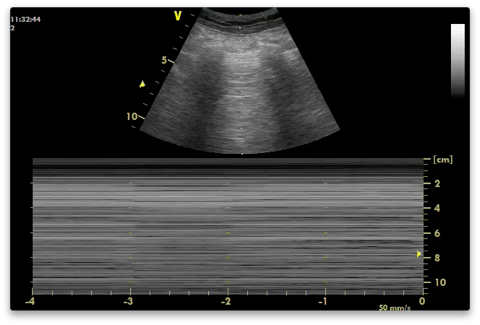 In the supine patient, the sonographic technique consists of exploration of the least gravitationally dependent areas progressing more laterally. Adjunct techniques such as M-mode and colour Doppler may be used. B-D1-S3 (weak: level C) Ultrasound scanning for pneumothorax may be a basic ultrasound technique with a steep learning curve. During assessment for pneumothorax in adults, a micro-convex probe is preferred. However, other transducer (e.g., linear array, phased array, convex) may be chosen based on physician preference and clinical setting. Lung ultrasound should be used in clinical settings when pneumothorax is in the differential diagnosis. Lung ultrasound more accurately rules in the diagnosis of pneumothorax than supine anterior chest radiography (CXR). Lung ultrasound more accurately rules out the diagnosis of pneumothorax than supine anterior chest radiography. 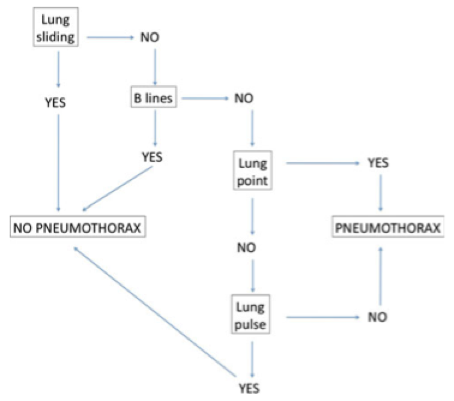 Lung ultrasound when compared with supine chest radiography may be a better diagnostic strategy as an initial diagnostic study in critically ill patients with suspected pneumothorax, and may lead to better patient outcome. 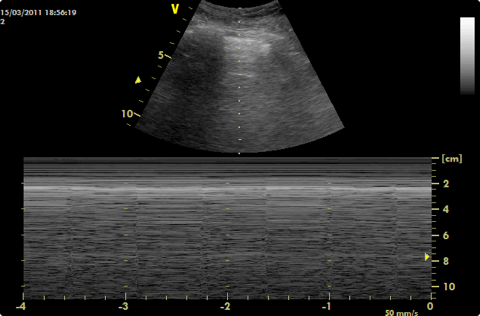 Lung ultrasound compares well with computerised tomography in assessment of pneumothorax extension. Bedside lung ultrasound is a useful tool to differentiate between small and large pneumothorax, using detection of the lung point.